For those in search of a true off-the-beaten-path adventure, Moose Lip Fish Camp is the perfect destination for those looking to experience real Alaska fishing. Located along side Lake Creek, Moose Lip sits just minutes away from the best fishing of your life. This experience is perfect for the avid fisherman; taking away the unnecessary amenities to give you the best and most affordable way to fish Alaska. We provide simple cabin style lodging, home cooked comfort food, and access to Lake Creek and other great rivers and streams in the area, during peak salmon season. The rest is up to you, Moose Lip does not provide a fishing guide service, giving you the ability to fish at your own pace and on your own schedule. The idea is to give you the perfect location to fish wild Alaska rivers, and let you explore and experience all its beauty. The river's edge is lined with numerous gravel bars, perfect for shore and wade fishing. Fly and Spin fishing is highly productive for all salmon and trout, and there are many versatile techniques that are effective. The fishery is rich and the river is fairly easy to fish even for the beginner. You will experience Alaska fishing at its best, fantastic views and wildlife. We think you'll fall in love with our precious piece of Alaska's nature. We strive to offer accommodations, in a remote setting, allowing you to access at your leisure, some of the best fishing in Alaska. 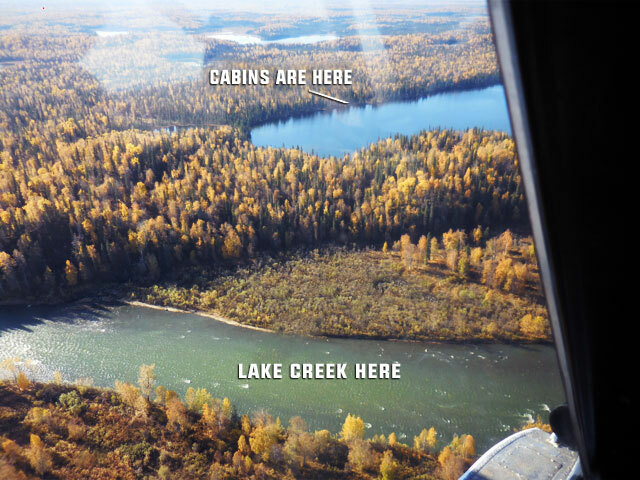 Lake Creek is a clear-water, freestone Alaska river system teeming with rainbow trout, arctic grayling and provides great Alaska salmon fishing for all 5 salmon species.